Remember how in the Merchants and Marauders review I said I couldn’t be trusted to hold an appropriately dispassionate view on a game about pirates? That remains as true here as it was there. Any game that adds in swords and swashbuckling adventure starts off with a hefty shove of the recreational momentum needed to crack my curmudgeonly shell. The shove gets harder when you give me a box that looks like I’m opening a treasure chest because I am at heart still five years old and enthralled by shiny doubloons. I won’t get too caught up in that here though. 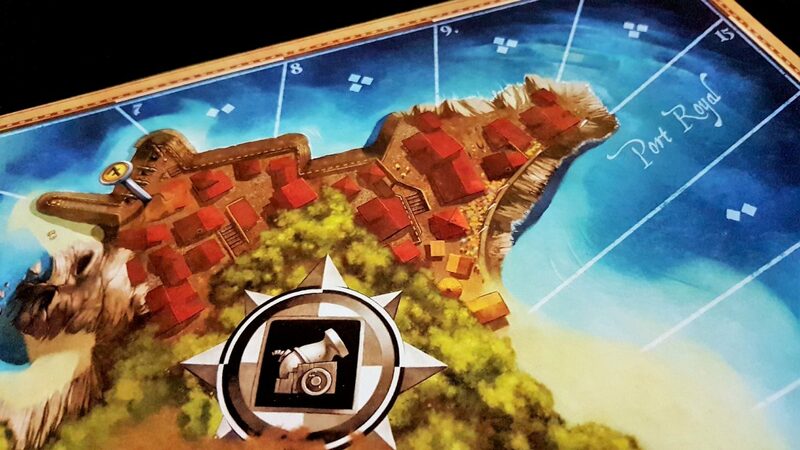 Jamaica is a game that wears its theme as an affectation – there’s very little in the game that really needs the salt tradewinds of the Caribbean to drive it forward. 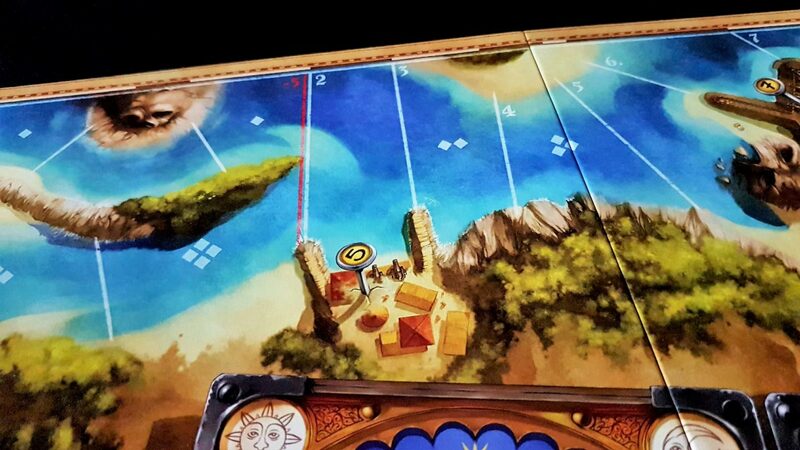 It’s set dressing – at its heart Jamaica is an uncomplicated racing game where the golden age of piracy is the setting and not the story. Not to worry though because you won’t even notice before too much time has passed. Jamaica is full of dice-chucking and drama, flavoured with a constant barrage of interesting decisions – you’ll be too busy to peek behind the curtain of artifice it has spread before you. It’s lovely there this time of year. 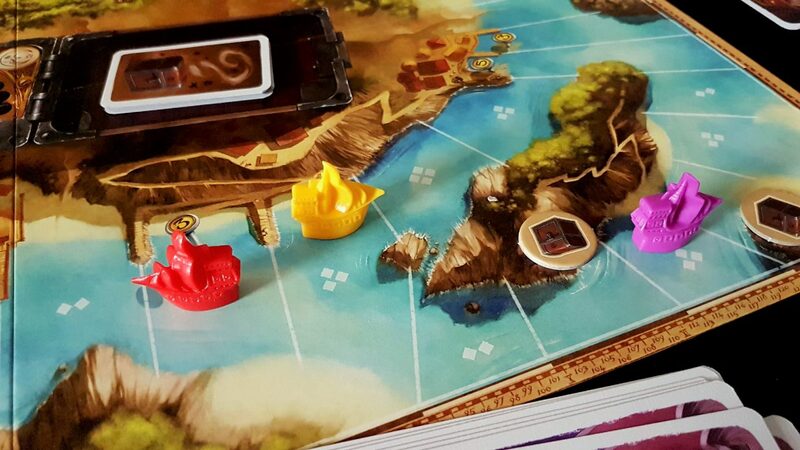 Each player takes on the role of a pirate captain, commanding a mighty vessel in a great race for treasure and glory. 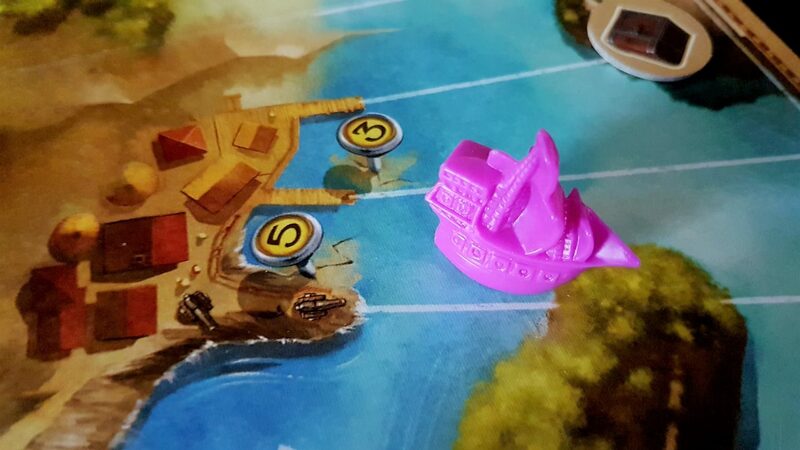 Each ship starts off in Port Royal, the greatest hive of scum and villainy in the 18th century Caribbean if we’re discounting Tortuga. 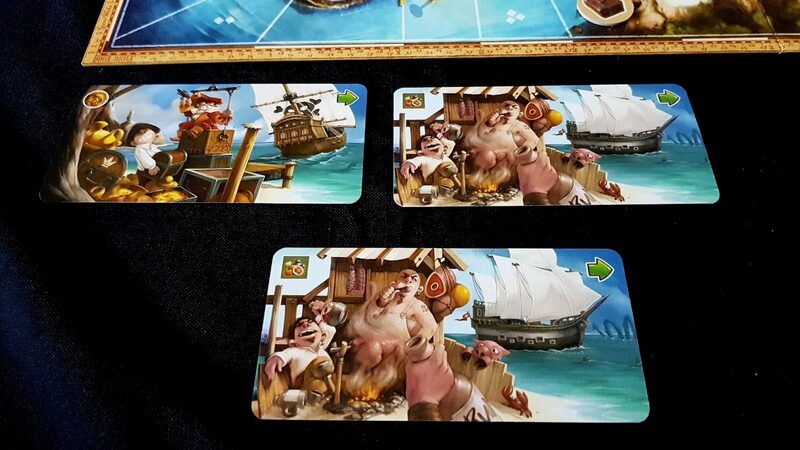 Each person around the table chooses their protagonist from a roster of six captains, load their vessels up with food and gold, and then begin the process of sailing their way at speed around the island of Jamaica. Along the way they’ll be looking to pick up treasures, balance optimal routes versus maximum reward, and generally try to make life difficult for everyone around them. If you’re old enough to remember Wacky Races, it’s like that but with pirate ships. If not, imagine Mario Kart with the occasional roar of cheerful cannon-fire. If you’re too young for Mario Kart then I guess just look out of the window at the apocalyptic landscape the older generations have left for you. Sooner or later, psychotic raiders in custom-built battle-cars will race past. Jamaica is a bit like that. 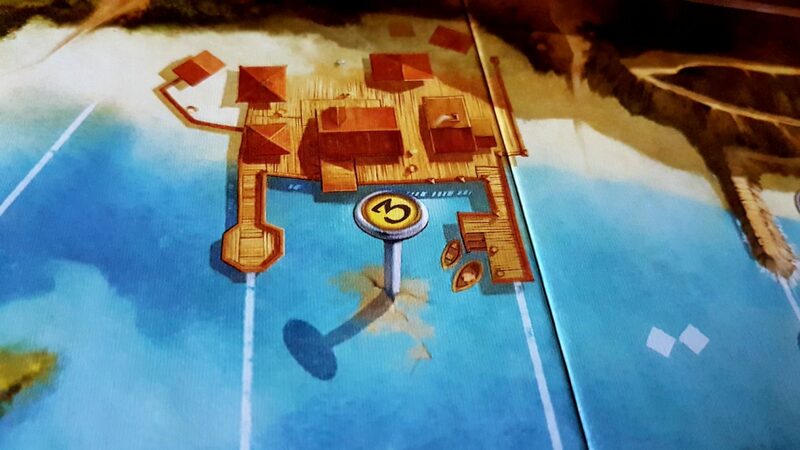 Each pirate cove comes with a treasure, and whoever lands there gets not only free berthing but whatever booty remains to be claimed. That might be an extra hold ready to be filled with shiny doubloons. It might be a super-powered cannon. It could be a curse that stinks up the ship until you reach the finish line. Usually, these treasures lie off the beaten path – rather than taking the shortest route around the island, you’ll have to make a potentially lengthy detour. As such, you often need to decide whether you’re going to take the gamble or whether you’ll aim for the more guaranteed prospect of safe and profitable water at the end of the race. But look at us – we’re talking about a race when we haven’t discussed how our ships propel themselves around this Caribbean circuit. How do we move, Michael? How do we engage in this race? How do we get food, or gold? HOW DO WE SHOOT THE CANNONS? MAKE THE CANNONS GO BOOM NOW! Calm down! I’m going to tell you because it’s the element that elevates Jamaica from clunky roll and move into something altogether more satisfying. 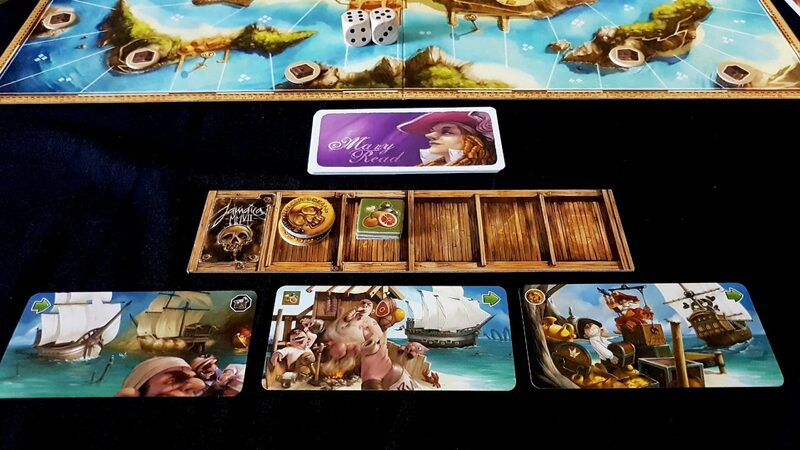 Each captain begins the game with a hold containing three food and three gold, and a deck of cards. 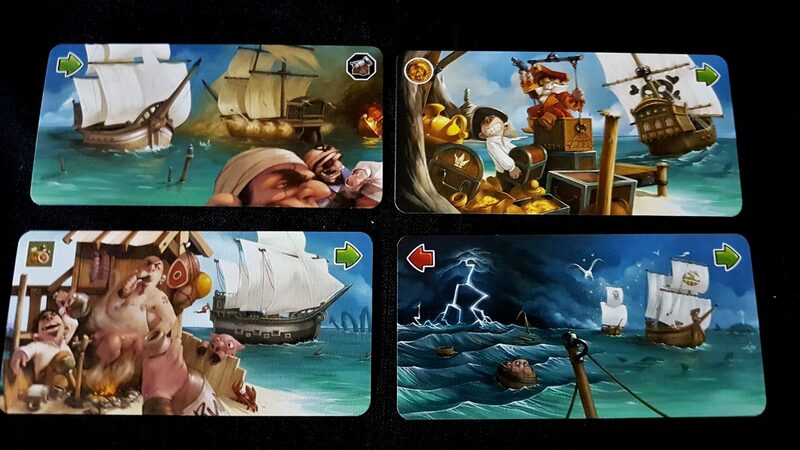 Three of these cards are drawn at the start of play, and those are the ship orders you can execute that round. Each card contains a day action, and a night action. Those actions might permit us to move forward, or move backwards, or load up gold, food or gunpowder. We’ll always do two of these actions in a round, and we’ll always do them in the order shown on the card. The number of times we do them though – that’s where it gets interesting. The current first player takes two dice, and rolls them. And then after consultation with their own cards they work out which die is to be allocated to the day phase, and which to the night. And then everyone picks a card from their hand and plays it face down. Understand that this element is the heart of Jamaica – this isn’t a game of clever mechanics interlocking in equally clever ways. This is a game where a single mechanic is buffed up to a fine shine. That’s always a risky strategy for a designer since if that one core system doesn’t work the entire game crumples as a result. Does it work here? Well, let’s see with an example! It’s always a good idea to load up on food, money and gunpowder, but loading has an additional complication – whatever you load up can only go in an empty hold. You can’t just keep redistributing everything until the ship is balanced. Think of it like a bunch of stressed pirates just trying to get stuff on board without having the time to do an inventory. As such, while you can throw goods overboard to make room you’re going to find those five holds cause more problems than they solve. Gunpowder is handy in a fight, but there’s no need to worry about it just yet – each gunpowder token we use gives us a bonus to combat rolls. We want enough food to travel the sea, enough money to land in port, and enough gunpowder to dissuade our opponents from attacking. But we don’t want too much of any of those, because it’ll make hold management a problem. And we don’t want too little, because that will make our progress impossible. Easy. 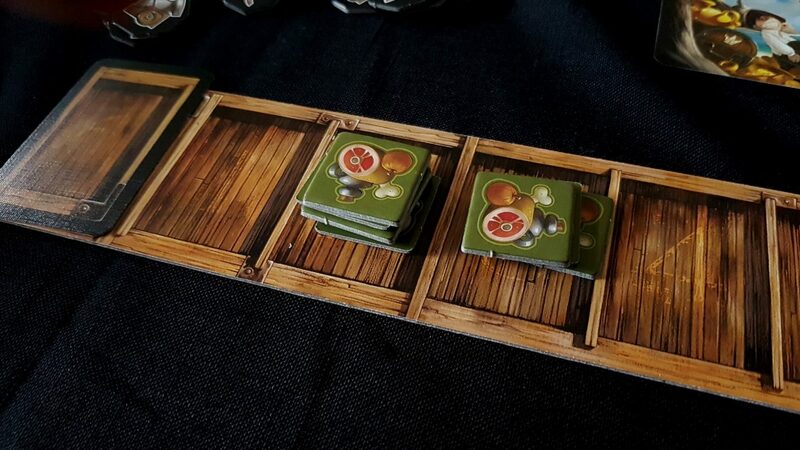 Our cards represent a restriction of options where we don’t just want to spend cards on the best action in front of us, but also make sure we hold back so that we can take advantage of the right rolls when they come up. We need to do something, but the clever move might not be the most immediately useful especially if the captain allocates their rolled dice in a way that doesn’t help us as much as we’d like. If we’re the ones allocating the dice, everyone is staring waiting for us to make that all-important element of the game-state public so decisions can be made. If we’re not, we’re the ones staring intently at the rolls like a cartoon dog eyeing up a roast chicken. Oh god, this changes everything! Once the dice placement is decided, there’s a flurry of activity and finalising of plans, and a bevvy of second-guessing and self-doubt before everything settles and the action begins. Everyone plays down their decision and then in turn order the cards are flipped and the two actions handled. Mary Read goes first, and flips over her card. Well, that’s got to be a mistake right? Look at where she is on the map. Five food is great, but that six is going to sail her into a port she can’t afford! Haha, what an idiot. So, she loads on five food into the hold (remember, it can only go into an empty hold) before sailing off into what’s sure to be an embarrassing blunder. Boy, I hope the crew mutiny for this humiliating mistake. Ah-ha, you’re such a muppet! Having loaded up, she moves forward six right into a port that costs a hefty five gold to enter. I hope there’s some kind of debtor’s prison in this game! She’s only got three, so she gets that confiscated and she gets kicked back to the next square behind her. Send my regards to the starting line! Haha, such an idio… wait, what? It’s a new hold! This gets added to her pirate board to give an extra space for cargo that can be used just like the other ones. This is a tremendous treasure, and there’s only one in the deck. You remove three treasures from this deck before play so sometimes it comes up and sometimes it doesn’t. It is though, ‘a good get’. It’s this kind of system that makes Jamaica so much fun. That core mechanic seems like it doesn’t permit particularly clever play but when it’s paired with the payment system it allows for you to be very sneaky by working out the implication of the penalties and where they’ll take you. Clever captains can can move themselves out of danger, or take advantage of another player’s choice to take one branch of travel rather than another. They can use it to propel themselves into combat like the Hermes getting a gravity assist on its way back to Mars. And here’s the awesome thing – if going backwards would take you past a fork, you get to choose which fork you take. You can pull off some serious Tokyo Drift action as you Fast and Furious your ship around the rapids and eddies of the sea. With a good number of players, this can create some very interesting strategies and ensures a steady schedule of mayhem. Even if you don’t have the right card, much of the tactical depth comes from making the wrong cards do the right things. You can’t always manage it, but if you can it’s a real thrill. However, you have to bear in mind that everyone else around the table will also be trying to bend their cards to the same improbable ends. Let’s get back to our example. Once the current first player has executed their phases, Anne Bonny goes. They take the much less interesting route of loading up five gold and then moving forward six spaces into a port they can now afford. They’re in the lead, but whether that means they made the wisest choice remains to be seen. 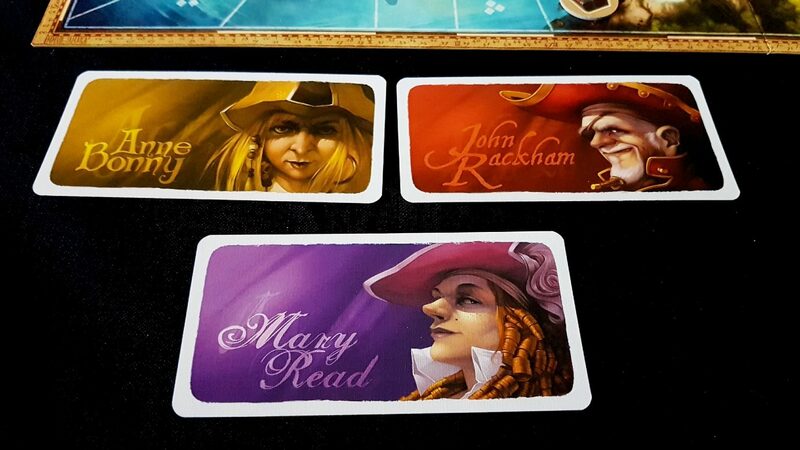 Player three though – well, they play the exact same card as Mary Read placed down. Oh my. See, just because you planned to be sneaky doesn’t mean you were the only one. Jamaica is as much a game of guessing the intention of others and at the likely opportunities those intentions present as it is about choosing the best card for you. Jack Rackham was hoping to pull off the same trick as Mary Read, but while he ends up doing the same move, the outcome is entirely different. He doesn’t pick up a shiny treasure, because Mary Read already grabbed it. Instead, when he enters her square a battle begins. As the aggressor, Jack rolls the special combat die first. If it’s a star, he wins instantly. Both players can spend gunpowder here to improve their rolls, and some treasures allow for re-rolls or bonuses on top of that. It’s a lightweight battle system, but that’s all to the good – Jamaica isn’t really a game of Errol Flynn style combat theatrics. Jack rolls a ten, and since he had no gunpowder that’s where the roll ends. Mary on the other hand doesn’t fare quite so well. He can steal that extra hold right out of her ship. In one turn of Jamaica, with the right number and mix of players, there’s more laughter and shouting and recrimination than in an hour of many others. And it’s this anarchy, round after round, battle after battle, that sustains the experience. Players are trading goods, beating each other to treasures only to lose them to someone else, and finding themselves miscalculating a grand play only to send themselves hurtling back towards the start, or into the sea space of an equally surprised opponent. 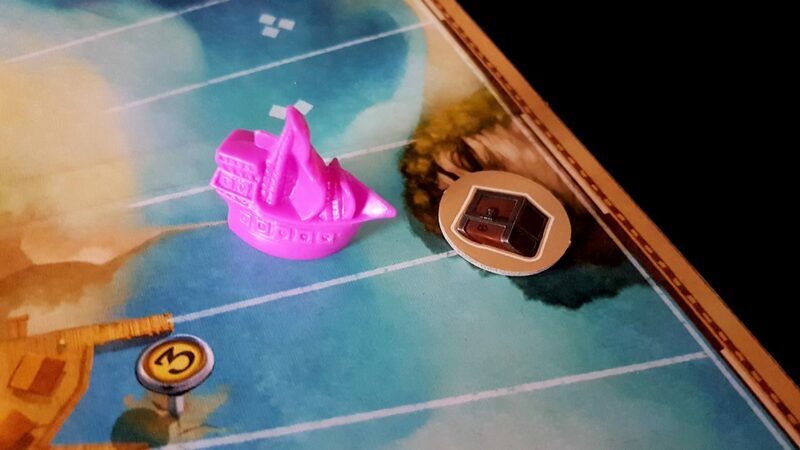 Jamaica is a game where much of what you do feels hilariously broken because strategically planning to take a penalty is often the precursor to nabbing a treasure. That seems counter-intuitive. The special power treasure cards are, by and large, extremely good and the impact they have feels overwhelming. Saran’s Sabre for example allows you to reroll your combat die, or reroll that of your opponent. If they sneak past your roll in a tough battle you can just ‘boop’ reroll it and see what happens. That means if you have acquired this powerful item you are a fearsome opponent on the board and people will likely try to stay well out of your way. 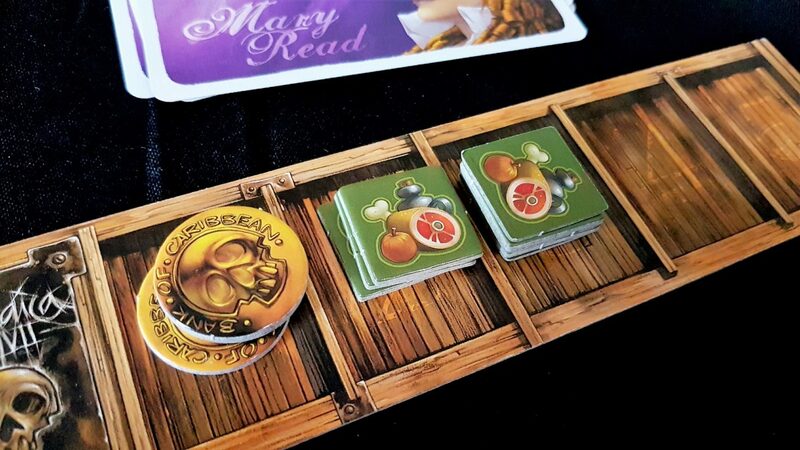 On the other hand if you have the extra hold you can merrily load supplies without worry – you’ll almost always have enough space and you can even turn your extra hold over to the doubloons that give points at the end. Morgan’s Map lets you hold four cards in your hand instead of three, meaning you’re far more likely to have the right card for the situation in front of you. Other treasure cards give hefty point bonuses, or are horrible curses. Imagine fighting someone to land on the square with a treasure to find it’s a four point penalty. Nightmare, right? Then imagine you did that only for someone else to land, attack your ship, steal a random treasure and take that cursed treasure off your hands for you. It gets everyone laughing almost every turn. At its best, Jamaica is joyful but that requires you to give yourself up to the anarchy of the experience. It requires you to let yourself go limp as your ship careens unevenly from side to side. You don’t really drive the ship – you just point it in an optimistic direction and hope the winds will carry you where you want to go. 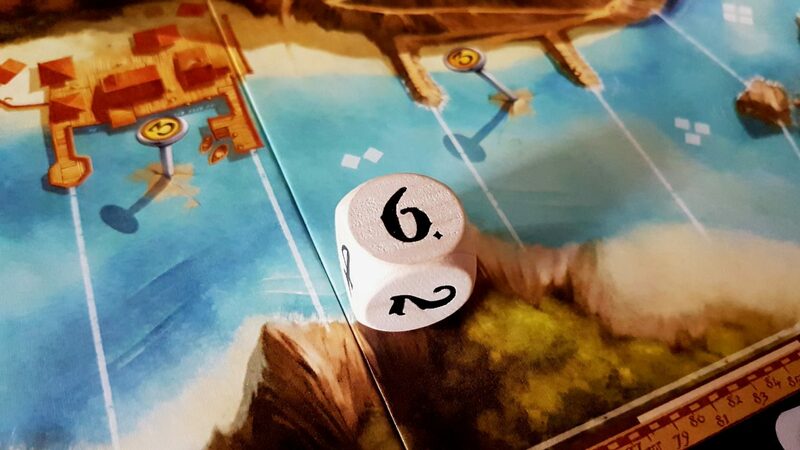 You have to surrender a lot of your sense of control to the dice, because sometimes the sea is effectively becalmed and there’s nothing you can do about it. 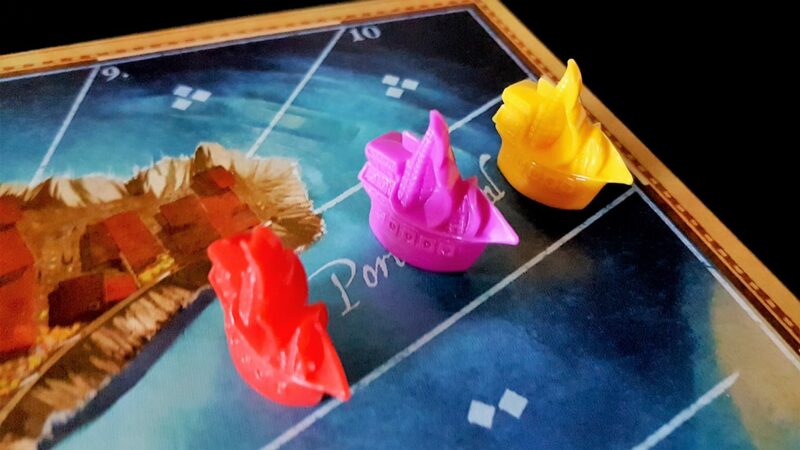 It’s also a game that thrives as an occasional experience rather than a repeated one – its simple, straightforward rules get everyone playing quickly but they also mean that unlike the Caribbean there isn’t a lot of depth. At the end of your first play of the game you’ll have a fairly good handle on the experience and it’s not going to mature with the passage of time. 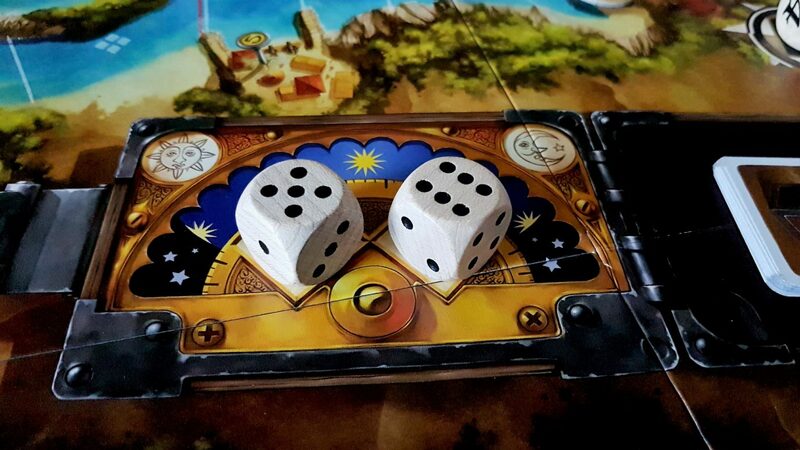 The more players you have, the more energetic the play can be – but in the end much as with Colt Express the stories remain largely the same even when the protagonists change. Having said that, the player count isn’t too restrictive – its two player mode was fun when we tried it. 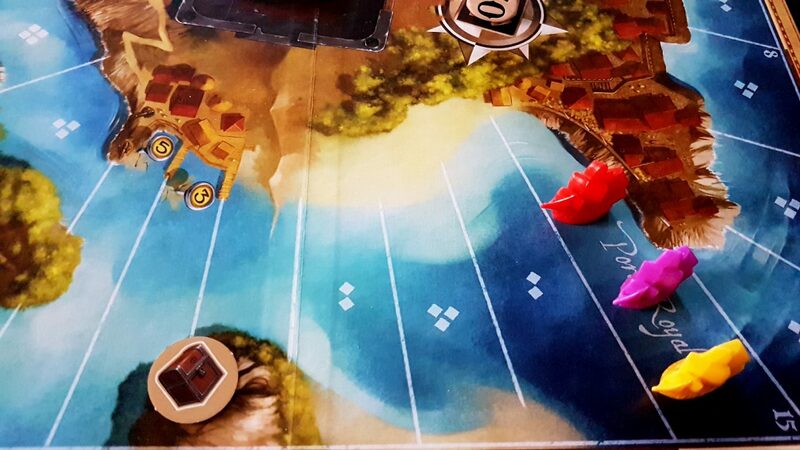 It makes use of a dummy ghost ship to add the necessary competition and contention to play. 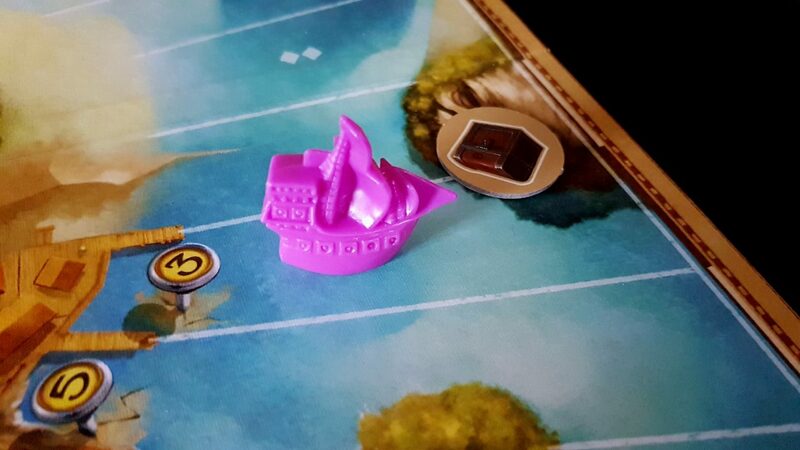 I might even recommend throwing the ghost ship in to a three, four or five player game every so often just to mix things up a bit. For a game with such a simple rule-set too it has a frustrating number of grey areas where house-rules will have to reign. For example, when you’re moving backwards as a result of a card action and can’t afford the destination cost – you then move backwards to the next affordable square. Is that backwards towards Port Royal (which is how we play it) or backwards towards the origin of the move? Either makes sense, but neither is articulated in the rules. 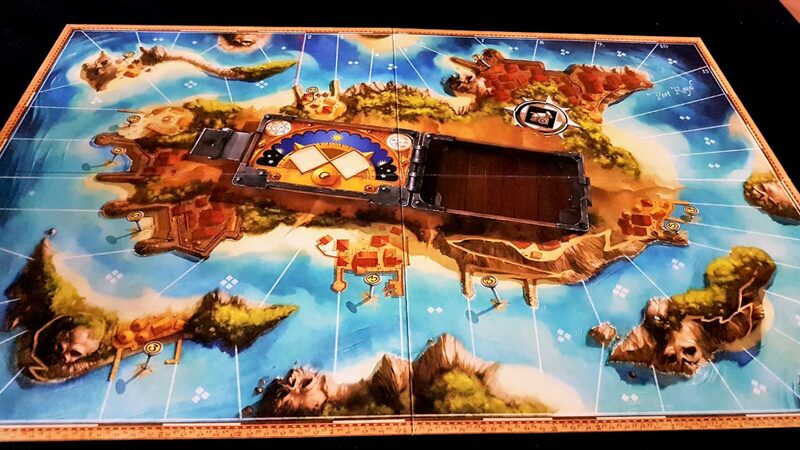 And as to the rules, I can’t stress how much I hate the ‘treasure map’ fold-out style of the manual. I understand it’s thematic but it turns checking the specifics of a situation into something akin to rifling through a recalcitrant broadsheet newspaper. The thing that keeps it from greater accolades in this review is that in the end it just feels a little bit flighty. 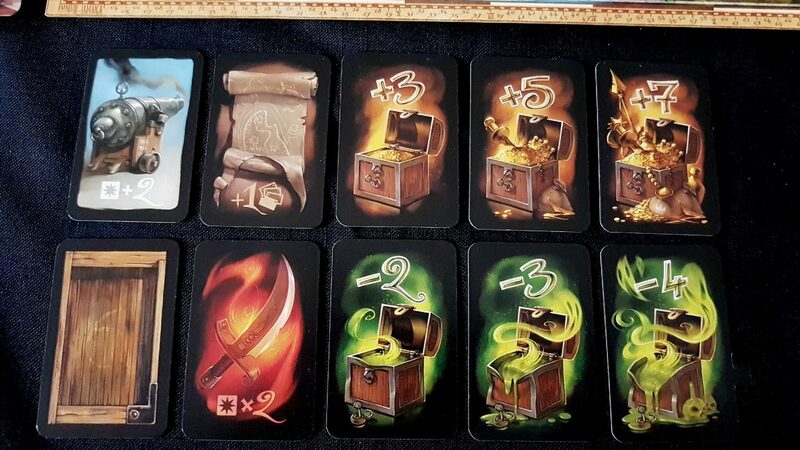 I would have liked to have seen more treasure cards for example – the ones that are there are fine, but while you don’t see them every game you’ll see them often enough for familiarity to dull their impact. 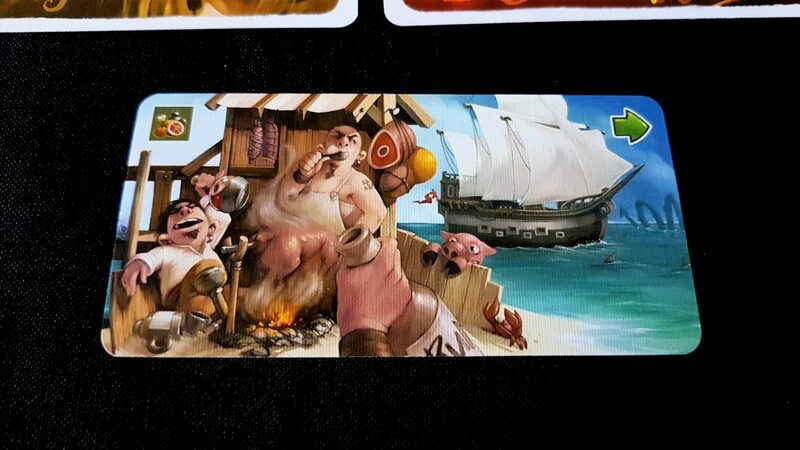 I would have liked to have seen some more asymmetry in the captains – different deck composition for example, or unique special powers. There is nothing in particular I dislike about Jamaica, but plenty that I’d like to see fleshed out more. 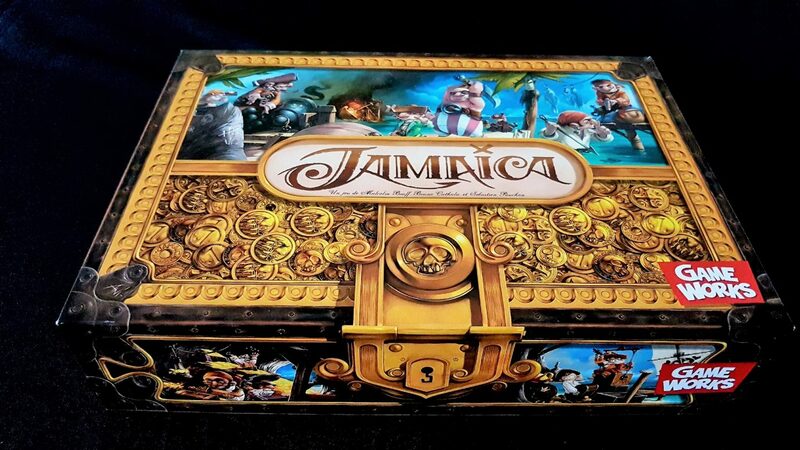 There was at one point I believe a Jamaica expansion that added in a few more treasures so it’s not like there isn’t scope in the design space for exploration. Some of that exploration should really have ended up adding to the richness of the base set. 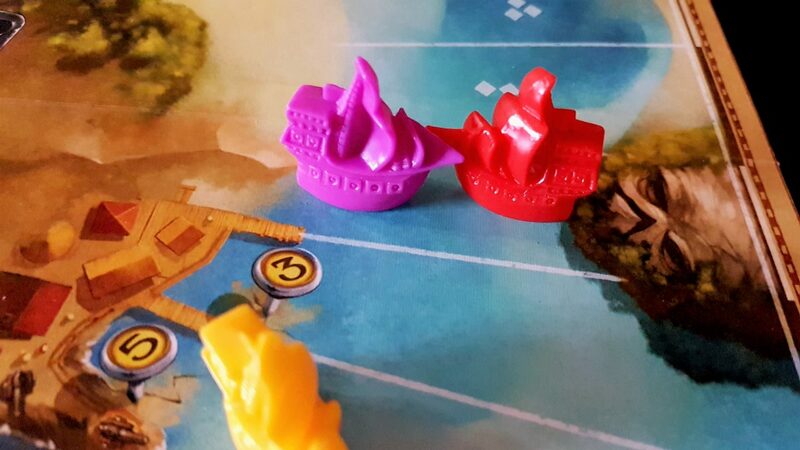 That said Jamaica makes no (skull and) bones about being a thematically light and simple game, and it excels in that capacity. 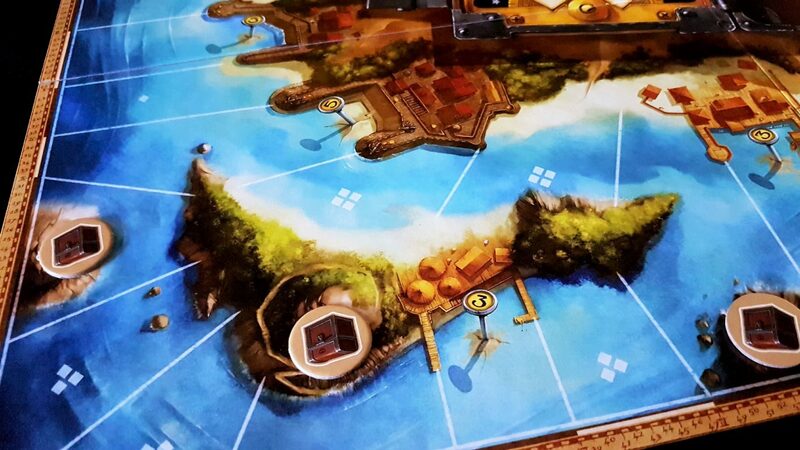 If I want a heavy duty pirate game then – well, Merchants and Marauders remains excellent. If I want something light and whimsical with just enough sea-salt to make it interesting then Jamaica is a solid choice. Finally, I can’t end this review without acknowledging the beautiful aesthetics. 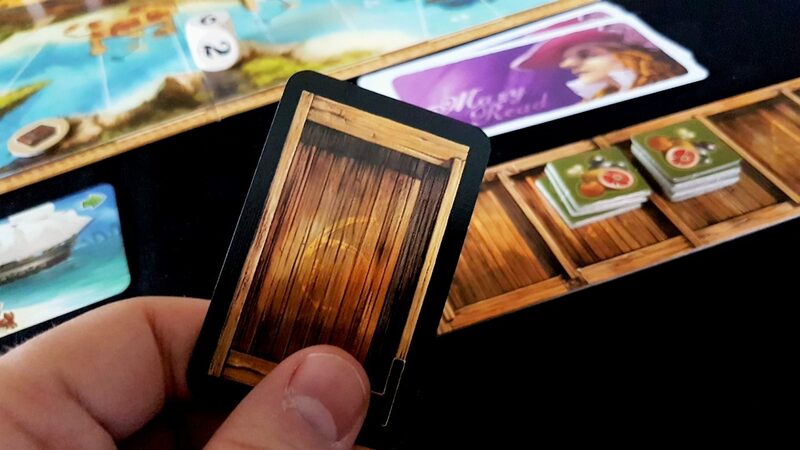 This is a remarkably lovely game that oozes charm from every cardboard crevice. Jamaica has superb production values and gorgeous art throughout – it’s a real treat for the eyes. My mother even specifically commented on how lovely the art was when we played. No, she said it of her own accord!